I don’t think I’ve made any secrets about the fact that I’m not a fan of the Kardashian Klan, but I they did all look pretty fabulous at Khloe Kardashian and Lamar Odom’s Fragrance Launch for “Unbreakable” last night at The Redbury in LA. Whilst I’m rolling my eyes at the fact that Khloe and Lamar have a fragrance to launch, I will keep this about fashion. 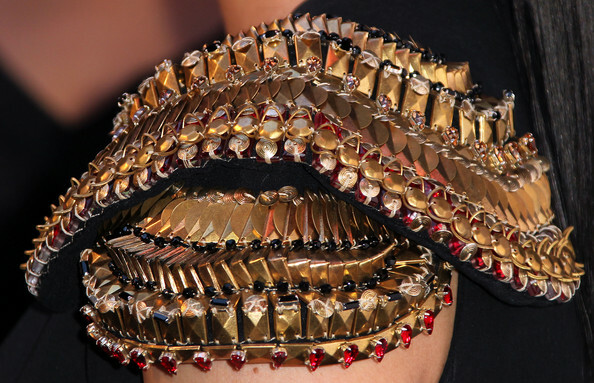 Kim opted to wear Salma Hayek’s Alexander McQueen Resort 2011 top with gold embroidered shoulder details. Black fitted pants, black pumps and a VBH clutch completed her look. I’m glad she wore her hair back with this look. Khloe also when for all black, but she added a pop of colour via her yellow Balenciaga envelope clutch. The star of the night opted for a Gucci black tuxedo jumpsuit from the Spring 2011 collection, which has a rope belt tied to the waist with tassels at end. The look is complete with wavy locks and two tone Christian Louboutin David Delfin suede and leather pumps. The most naturally stylish one of the group Kourtney, wore a T Bags kaftan. She accessorized with a fringed H&M necklace and a tan Proenza Schouler PS1 clutch. Whilst I’m loving Kourtney, I’ve gotta go with Khloe in Gucci on this occasion. It’s so refreshing not to see her trying to out dress Kim in the shortest tightest dress she could find.